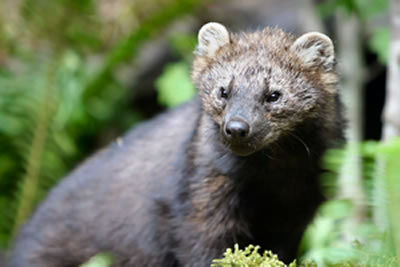 The Northern Rockies fisher (Pekania pennanti) is a secretive carnivore that dwells only in old growth forests in parts of Montana and Idaho. This cat-like member of the weasel family is rarely seen. Its slender brown body and long bushy tail are covered in thick fur, making it well adapted to the deep, cold forests in places like the Bitterroot Mountains of Montana. It is a powerful creature, preying on small mammals including porcupines. Needless to say, it’s one tough beast. It’s also at risk from the activities that imperil these old growth forests and the other predators that live there. Logging and outbreaks of fire, insects, livestock grazing, and disease have vastly reduced and isolated their habitat and continue to consume thousands of acres each year. The disappearance of old growth forests diminishes and fragments the isolated habitats in which they occur. Climate change makes the forests­– and the fisher– more vulnerable to these threats. One additional threat is worth focusing on: trapping. It is still legal to trap the Northern Rockies fisher in Montana even though their numbers are declining, and traps end up killing a large number of fishers in Idaho where there is no open season on the species. Traps set for other species such as martens and bobcats and, more recently, wolves, end up killing the rare fisher. In Idaho a total of 22 fishers were captured and 15 died in traps set for wolves during 2011/2012 trapping season. Hence, the hatred for wolves and the unethical delisting of them under the Endangered Species Act (ESA) further imperils the Northern Rockies fisher. It’s a trickle down effect of the widespread intolerance for predators stemming from the sanitized landscape of livestock operations. In August 2013, WWP and our allies submitted a listing petition for ESA protection with the hope that new genetic information that distinguishes the fisher from the marten and an increase in trapping deaths of the species will prompt the Service to take action and provide this interesting mammal with meaningful conservation management. The Service must issue an initial finding on the new petition within one year.